Caption slip reads: "Photographer: Sandusky. Date: 02-27. Assignment: Protest blasting in Bel Air. 6 negs. 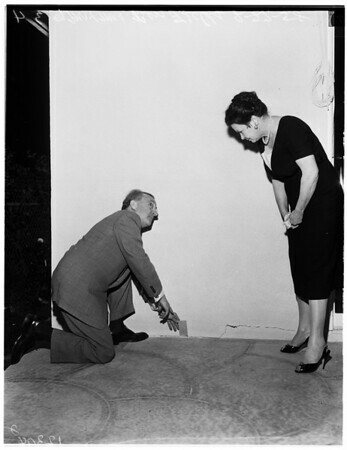 Mr and Mrs Ben Fields showing Los Angeles Police Department Captain Cummings mountain which threatens to crumble onto their Bel-Air home due to blasting on reverse side of hill. Two negs show Fields and wife examining crack in foundation cause by blasts".